Argentine star Messi 30, and his bride, 29, met when the player was nine years old. Courtesy photo. Following the private ceremony, the couple appeared happy and relaxed as they walked a red carpet before hundreds of journalists at a hotel and casino complex, Roccuzzo donning a tight, mermaid-style gown by Spanish designer Rosa Clara. The couple’s children Thiago, four, and Mateo, one, had front seats at the ceremony attended by some 260 guests, including Shakira and her husband, Messi’s teammate Gerard Pique, and numerous footballers such as Messi’s Barcelona strike partners Neymar and Luis Suarez. 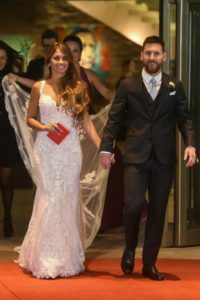 Argentine media called it the “wedding of the century” for Rosario, the gritty northern port city where Messi, 30, and his bride, 29, met when the player was nine years old. Former Barca and current Chelsea star Cesc Fabregas was in attendance, along with Argentina and Manchester City striker Sergio Aguero. 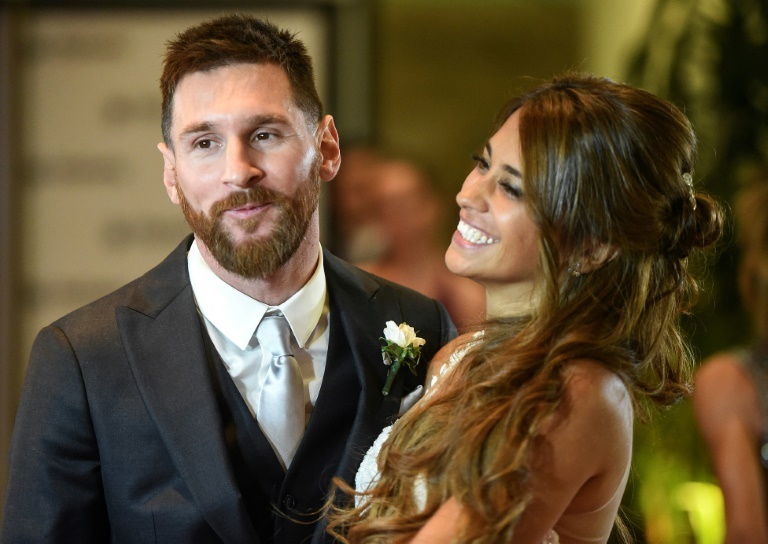 Childhood sweethearts Lionel Messi and Antonella Roccuzzo walk the red carpet following their star-studded wedding. Courtesy photo. Messi and Roccuzzo live in Barcelona where he plays, but still return regularly to Rosario for vacations. He moved to Spain when he was 13 to join FC Barcelona, but the couple kept in touch. Messi has gone on to win the top Ballon d’Or award five times and is widely regarded as the world’s best footballer.